Things are crazy busy this week - I've got to finish off around twelve paintings and six dresses in time for the exhibition at world bar next week. Trying really hard not to stress out but i know the overwhelmed part of me is dying to retreat to bed with too many easter eggs to watch a million episodes of gilmore girls in a row. Wish me luck. p.s. i finally caved and got myself a tumblr! i'll just be posting silly personal things and 'what i wore' drawings and excerpts from my closet. 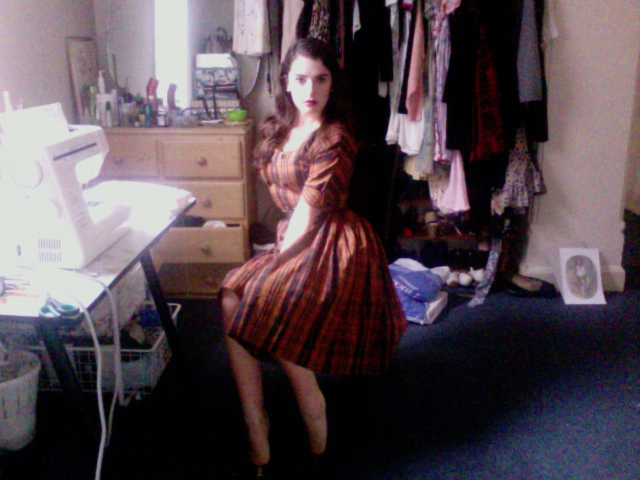 me + sewing machine + pumpkin coloured 1950's Jonathan Logan dress. oh hi! Btw, I have that dress too! Always fun to see someone with the same vintage dress. You have the same dress?!?! Isn't that an insane coincidence - it's so rare to find two of the same vintage dress nowadays. Oh god, I feel exactly the same about my dress obsession. It's pretty terrible because I don't actually have a job, but I am acquiring vintage at such a rapid rate since I moved cities. I find myself often offering to walk my boyfriend to work so I can check out the great consignment shop nearby that is open til 7 on weekdays! I found an amazing gingham and floral-prubt 1950s day dress (not even in the 'vintage' section!) there the other day for $25. It's ridiculous. The Lure of beautiful dresses! It's too much for a girl to handle! haha! p.s. thankyou! I am verrrrry excited for the package and it's splendorous velvet contents. You do look stunning, just like one of your own paintings. oooh, why thankyou! That's just the kind of thing one likes to hear. heh. Thanks Monika - i think if things go well i'll be introducing a little range of custom made dresses to my online store! The lookbook hasn't arrived yet? How odd! I think HPmagcloud can be rather slow with delivery sometimes. Maybe give it another week and then let me know. <3 the dress! I'm looking forward to next week :) I'm sure you'll get everything done.